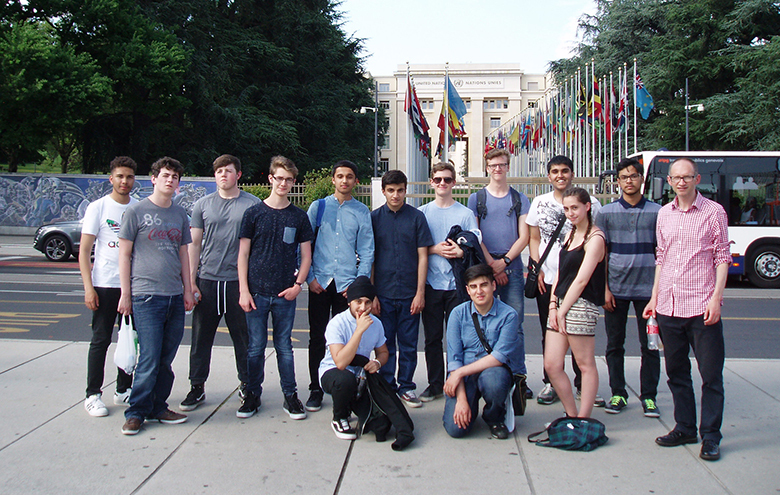 Engineering students from The Sixth Form College, Solihull got a taste of advanced quantum mechanics over the summer, thanks to a visit to CERN, home of the Large Hadron Collider. Students who were part of the College’s Engineering Academy, went on the 3-day trip to Switzerland to learn about the work of the European Organization for Nuclear Research, where physicists and engineers are probing the fundamental structure of the universe. The students discovered how CERN is helping to answer some of the most fundamental questions; how did the Universe begin? What are the basic building blocks of matter? There were two exhibitions visited: Universe of Particles in the Globe, and Microcosm which explains the experiments at CERN starting from the bottle of hydrogen, the source of protons. They also went to the Superconducting Magnet Testing Centre. While in Genèva, the students also visited the Musée d’Histoire des Science de la Ville de Genève and the Muséum d’Histoire Naturelle de la Ville de Genève. They had time to explore Geneva using the extensive travel mechanisms: trams, buses, boats and trains, as well as walking around the lake and the city centre. Another highlight of the visit was a traditional Swiss fondue dinner with musical entertainment. In addition to the Alpine horn, tuned cow bells, a saw and wooden spoons were played. The UK has been a member of CERN since the organisation was founded in 1954. Membership allows British researchers to take a wide variety of roles that contribute to CERN’s on-going success; from recently qualified technicians and university undergraduates gaining their first taste of working in an international environment to PhD students analysing experimental data and experienced engineers and physicists leading projects or representing their experimental collaborations.